Another Arts & Crafts masterpiece built by Douglas Construction Group (voted Best Green Builder (2012 & 2014) & voted The Face of Custom Homes (2016 – 2018) & voted Best Builder (2018) – by Bethesda Magazine readers). Brand new Chris Lapp, AIA transitional design and open floor plan boasts over 5,500 finished square feet on 3 fully finished levels. 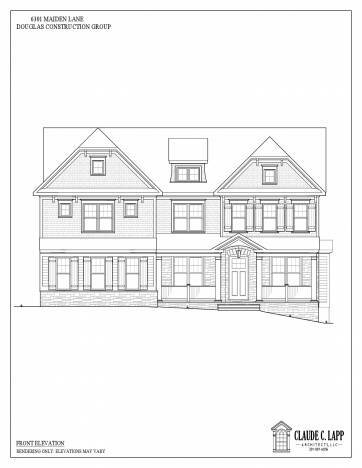 5 bedrooms, 4 1/2 baths, mudroom with built-ins and walk-in pantry, great room with fireplace and built-ins, dining room, butlers pantry, study on first floor, gourmet kitchen including huge island with seating and separate breakfast room. Upper level I with its master suite with spa-like bath, his & hers walk-in closets, 3 additional bedrooms, 2 full baths and laundry room. Lower level with the recreation room, game room, exercise room and 5th bedroom and full bath, and so much more…. In Walt Whitman High School District. Too many DCG inspired finishes to detail. Time to customize – this one will not last. Floor plans are listed below. Estimated delivery date: Fall 2019.